George-Little Rock, the upset kids in the 1A State Boys" Basketball Tournament, brought home a first-ever state championship trophy to a huge homecoming affair at George Sunday afternoon. Tried and tested in the battlefields of the tough Siouxland Conference, the Mustangs defeated Rock Valley, Boyden-Hull, Charter Oak-Ute, Treynor, Waco and Bellevue Marquette on the tournament trail. Ken Roseberry, athletic director and girls" basketball coach at George-Little Rock, praised the team for their accomplishments. "It was a team effort. This team has good chemistry," Roseberry said. "Many of them spent every 8th period in this very gym to try to be the best they can be." Speaking of Tyler Fluth, Roseberry said, "I saw 10 games at the state tournament. Tyler was the best player I saw play." Fluth was named co-captain of the all-tournament team. City officials from George and Little Rock addressed the crowd of enthusiastic and loud fans. School board member Warren Tiedeman congratulated the team "way down to the end of the bench." Coach Ben Gerleman, in his fifth year at George-Little Rock, introduced the assistant coaches and each of the team members and managers. He presented them each with a medal and a DVD of the championship game. 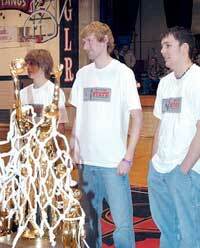 He asked that the state trophy be displayed at the middle school at Little Rock for one week. "I am so pleased with the positive way this team represented George-Little Rock," Gerleman said. "Now the rest of the state knows where we are and who we are." He thanked the team for putting George-Little Rock on the map. "I get to work every day with these special kids, but they have to be willing to get the job done," Gerleman said. The team did not had an opportunity to cut down a net during the tournaments, so he invited each one to cut a piece of the net which hung on the championship trophy. He declined to cut a piece for himself as he said it was the kids who deserved it. Members of the team then addressed their fans. Tim Kruse mentioned all the firsts the team had. "We defeated Sioux Center on their floor-that was a first. We beat Boyden-Hull in the tournament, another first," Kruse said. "We were the first to play in the Wells Fargo Arena, and we brought home the first state championship trophy." "Toward the end of the championship game, when things were so tight," Gerleman said, "I called a time-out, and told the team that we were going to get fouled, but we were going to make their free-throws and win the game." "Winning the state feels so good - not only for me but for all the team," Fluth said. "I couldn"t have accomplished what I did without them." broke scoring, rebound and assists records, but basketball isn"t about one player. The thing about Tyler is he made all the other team members, and me as a coach, better. He could have had more points if he would have shot every time he had a chance, but he is a team player, and that is what is so special about him." Coach Gerleman closed the pepfest by encouraging the younger students present. "It"s up to all you younger kids to keep this going. I"ll be here, and I"ll be helping you, but it will still be up to you. "And you seniors, don"t let this be the highlight of your life. Sure, enjoy this time. It"s exciting and huge. But move on to bigger and better things. In years to come, recall it, tell your future children about it. You"ve set something up in this school. Now go make our world a better place to live."